This time of year can be exciting for many children and families who enjoy attending bonfire and Diwali celebrations both at home and at larger events. 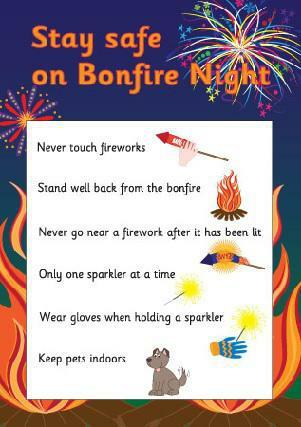 It is really important that all our children learn how to stay safe while enjoying these special events. During our Diwali assembly this morning Mr Lamorte reminded children and Year 1 parents of these rules in order to educate them and help to keep children safe. A copy of these rules can be found below. We really hope everyone enjoyed their special Diwali celebrations and enjoy attending bonfire events this weekend. We look forward to seeing all children back in school safely on Monday.